FD Kitchen and Bath is a family-owned design and sales studio specializing in the design and installation of custom kitchens, baths, and closets in the greater Morgantown area. We service North Central West Virginia and Southwest Pennsylvania, including Morgantown, Fairmont, Bridgeport, Clarksburg, Cheat Lake, and Bruceton Mills and surrounding areas in WV, as well as Washington county in PA.
Floann and Ken Downey have been in the residential construction business since 1995. The company has been performing a range of business from small remodeling to complete turnkey homes and a dealer/contractor services with Real Log Homes. Recent years have focused on specialty remodeling and log home services. Ken’s roots in the construction business started by working for his contractor brother in high school and college. After working for seven years during the summer, holiday breaks and Tuesdays and Thursdays through college Ken proclaimed an end to hard labor and the construction industry. What followed was fourteen years of management with Kroger, Chico Dairy, and his own distributorship with the Little Debbie. During those years Ken and Floann built two homes for themselves during the weekends and evenings. Ken also built many decks and remodeled kitchens for family, friends, and others. The demand for Ken’s work built so fast that by the summer of 1995 they chose to start their own company. Tonya Foltz has been designing kitchens for over a decade. She began her career right after graduating College with a Graphic Design degree in 2003. She had always had an interest in construction, architecture and interior design and decided to combine her degree with her love of residential design to become a kitchen/bath designer. 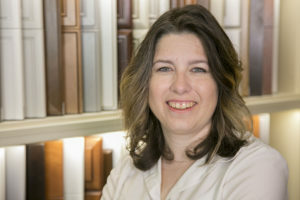 Tonya began her career as a family owned and operated custom cabinet factory showroom, in Hagerstown, MD. She designed kitchens and baths for homeowners in the D.C. metro area. After moving to Preston County in 2005, she worked at General Glass Home Center until they closed their doors in early 2014. While at General Glass, she was introduced to Ken as a quality contractor, who could install the more detailed, custom kitchens, and baths. Since his work was impeccable and beyond reproach, a long-standing business relationship was formed. With the closing of a long-standing local supplier, the need was created for a Design Studio that was rooted in the community. A place where contractors and homeowners alike can come and get material and customer service unlike what they would receive at a big box store. We pride ourselves on the relationships we build with our customers and try to create friends for life. Growing up on a rural farm in central West Virginia has given Project Manager Evan Updegrave a knack for crafting works of art with his hands and the ability to not shy away from hard work. While Evan graduated from WVU in December of 2005 he soon realized that he wasn’t quite ready to sit behind a desk. Evan put his efforts into a landscaping career building retaining walls and patios which later led to the creation of his own landscaping business, Almost Heaven Landscaping. To avoid the dreaded task of snow removal in the winter months, Evan sought out a position with FD Kitchen & Bath and soon became a full-time employee. 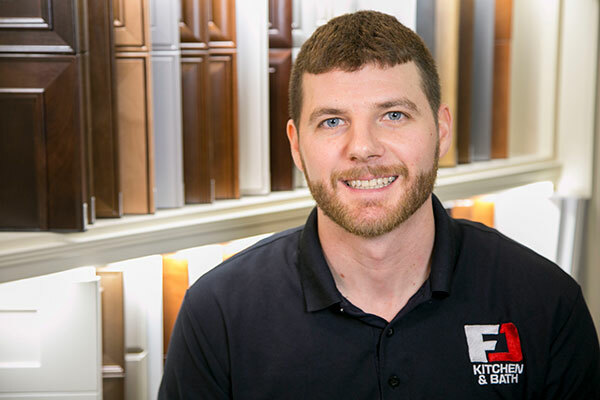 Evan learned the construction trade from the ground up with his first days full of peeling wallpaper and sweeping floors to now 7 years later holding the position of FD Kitchen & Bath’s Project Manager overseeing all construction projects. You will see Evan frequently on the jobsite making sure that our installers have all materials, communicating installation instructions, as well as picking up the hammer himself from time to time. One of Evan’s main goals is to ensure that the finished kitchen, bath, closet project matches the integrity of our designers well thought out plan all while accomplishing the customer’s vision. When not at work you can find Evan on the links or supporting the Mountaineers at a sporting event with his girlfriend, Kiley. Evan also enjoys traveling and has had the opportunity to travel abroad several times. Evan has used his international travels to inspire renovations at his own home and rentals.